In Europe, a number of people use Modiano Golden Trophy deck in the casinos or in private games. And the prevalence of Modiano Golden Trophy deck of cards gives rise to the appearance and popularity of Modiano Golden Trophy magic marked deck to a large extent. With Modiano Golden Trophy magic deck of playing cards, you can be the biggest beneficiary in the poker games. ​What is the magic of this kind of marked playing cards? By processing the Modiano Golden Trophy cards with invisible luminous ink, this marked deck of card is no longer an ordinary poker deck though it looks the same with the unprocessed Modiano Golden Trophy cards. Invisible to our human naked eyes, but detected by infrared contact lenses or ultra sunglasses is the key point of Modiano Golden Trophy magic marked cards. In this way, you can play the poker magic tricks in the game. 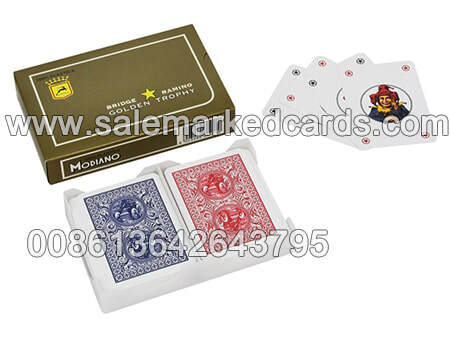 ​Modiano Golden Trophy magic marked deck is marked with luminous invisible ink marks on the back. Usually, there are two patterns to mark the Modiano Golden Trophy magic deck. One is a jumbo on the centre and the other one is four small fonts on the corners. What’s more, you can customize the Modiano Golden Trophy magic deck in different patterns if you like. Under any circumstance, our company will do our utmost efforts to meet our customers various needs. It is known to all that Modiano Golden Trophy deck is 100% plastic, so Modiano Golden Trophy magic deck requires high-tech cards printing and professional skill of technicians. Not every the poker cheating device company has such strengths without which the Modiano Golden Trophy magic deck in low quality will be produced. To avoid the occurrence of this situation, our company has been spending a lot of money, time and energy in improving and perfecting the quality of the Modiano Golden Trophy magic deck. 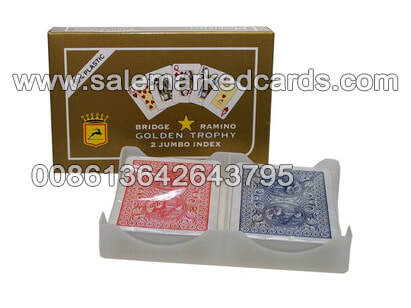 Thus, our company is able to guarantee the quality of Modiano Golden Trophy magic deck. 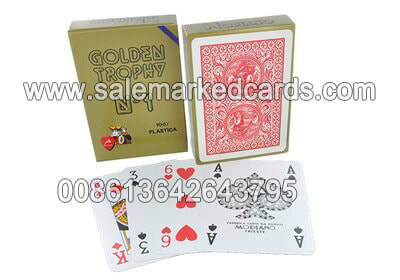 Here in our company, we import quite a lot of Golden trophy playing cards, as well as other cards from Europe. We have both single decks and sets of double decks in stock, including jumbo index ones and 4pip regular index ones. Thus we can offer both jumbo index Golden trophy marked decks and regular ones. If you want to know more information or to buy Modiano Golden Trophy magic marked deck from our company, just feel free to contact us please.